The recipe for this cake with lemon mousse quince and chocolate is not just one of those “exact” recipe, but much more than that. A real joy for the senses! 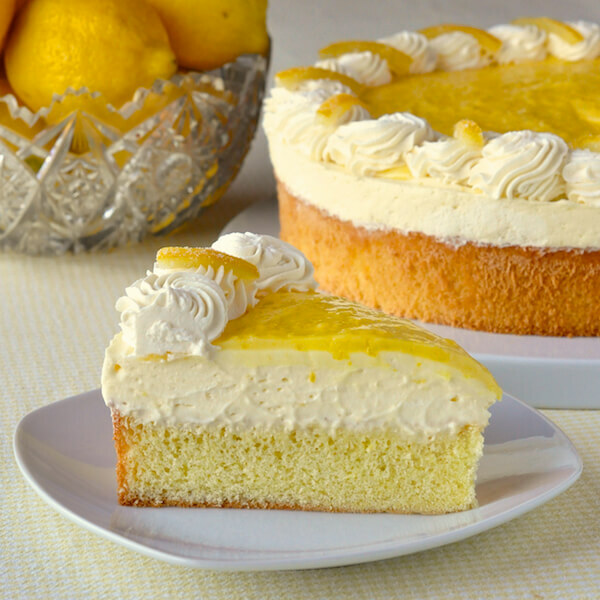 Taste it captivates with its lightness and freshness of lemon achieved based cream based. In addition, juicy fruit pieces and finish of grated dark chocolate makes it undeniably compelling. This dessert e suitable only be prepared at any time of the year because of its freshness and lightness, as would also be a great culmination of a summer garden party. For swamps: 6 pcs. eggs, 10 p. l. sugar, 4 p. l. of water, 6 p. l. vegetable fat, 8 p. l. wheat flour, baking powder pinch. For the syrup: 200 ml. water, 3 p. l. sugar, the juice of a half lemon. Six eggs necessary for marshes, separate the whites and yolks. Proteins are broken down until thickened until fluffy snow, then gradually add the sugar, alternating with water (2 p. L. Sugar, beating, 1. L. Of water). One by one, add the egg yolks, each should be mixed well before crashing the next. Add vegetable oil, and here is the latest whipping with a mixer. Flour mixed with baking powder, pour gradually to the mixture, stir gently with a wooden spoon or spatula to not lose the air consistency. Cake layer is baked for 20-25 minutes in a round tray, covered with baking paper on 170`S. At the same time makes the syrup, which is boiled for ten minutes in a small saucepan and set aside for the later part of the preparation of the cake. To prepare lemon mousse initially broken three egg yolks separated from whites, milk and 3 in. L. Sugar. The homogeneous mixture was transferred to a water bath and stirred for about 10 minutes, then was removed from heat. Gelatin was dissolved in 3-4 s. L. Milk and together with the grated lemon peel of one is added to the yolk mixture, stirring until complete dissolution of the gelatin. In another deep pot with 4. L. Sugar crashes confectionery cream until very fluffy and air. At this point a very thin stream and marked a steady evolution stirring pour the juice squeezed lemon as sharp hardening of consistency should not bother you as this is the normal reaction that follows lemon. Individual proteins are broken down into snow by 5 p. L. Sugar. Take the first already chilled mixture of egg yolks and stages added to the cream, which is stirring again only with a wooden spoon or spatula. Once these proteins are added and delicately mixed until achieving a homogeneous cream. 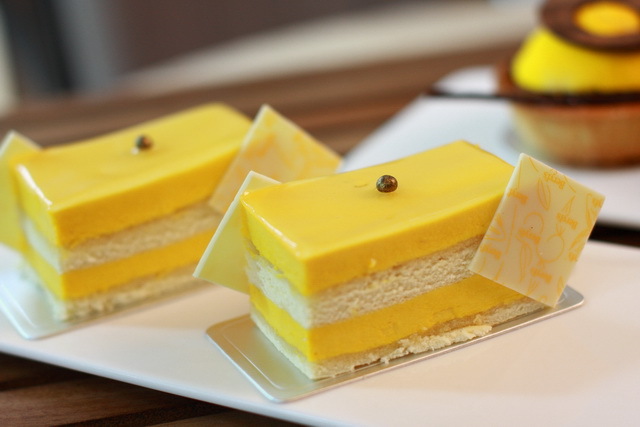 This is wonderful lemon mousse – a pleasure for all your senses. Finishing touches – assembling the cake. Take the first crust and evenly syrup with half the syrup. On it was poured generous amount of mousse and gently distributed over the entire surface. Optionally scattered pieces of fruit cut into thin. In this case, the fruits are preserved quince – a highly aromatic fruit. Then on them they have the second crust and syrup with remaining syrup. Cover with lemon mousse, smooth the surface carefully with a spatula, being smeared and sides of cake. Finally dessert generously sprinkled with chocolate chips or other topping of your choice.